The Academy of Indian Music was formally inaugurated in May 1988 for the purpose of fostering the development of Indian Classical music in Australia, particularly in the Karnatic tradition. It acts through the provision of educational facilities for students, and the presentation of concerts by local and overseas artists. The Academy can be contacted by email to M. Ravichandhira - ravi@netspace.net.au or by mail to P.O. Box 128, Kew, Vic. 3101. 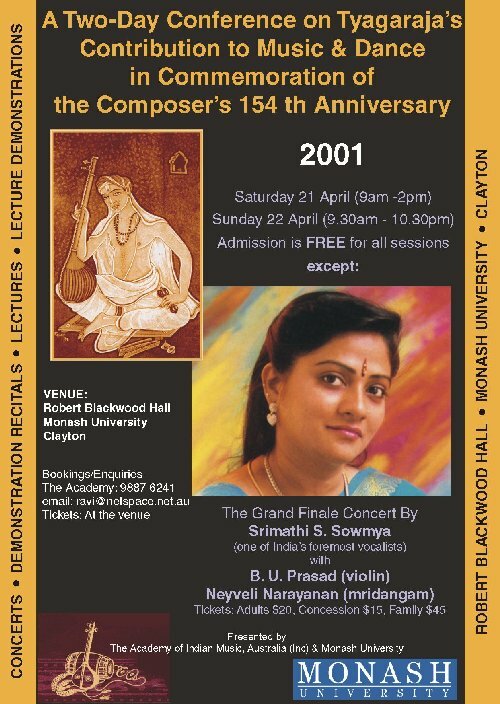 There has been a change in venue for the Tyagaraja Festival from Robert Blackwood Hall, Monash University to Alexandera Theater Monash UniversityClayton.